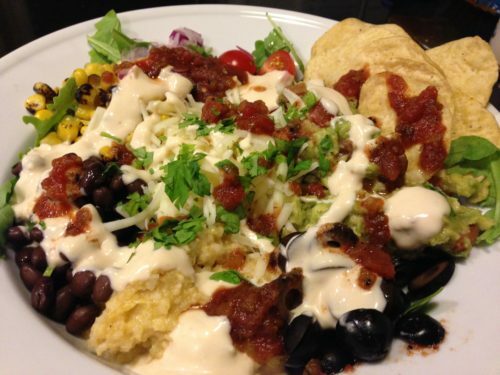 Tex Mex Bowl. 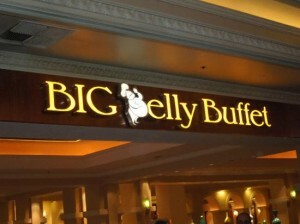 Food Bowls have become popularized by Chipotle restaurant chain as well as other restaurants. You can order a “burrito bowl” instead of a wrapped burrito to forgo the carbohydrates and fat in the calorie-laden flour tortilla. The same fillings in the burrito are then served in a plastic bowl. 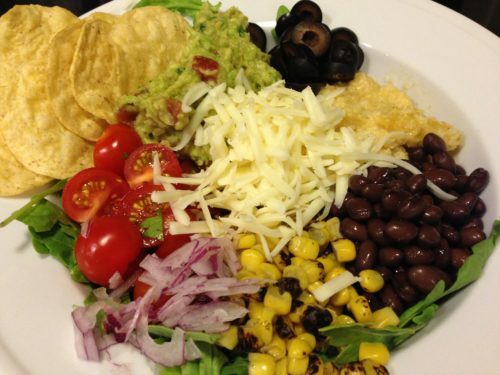 Call it a Burrito Bowl, a Taco Bowl or a Tex Mex Bowl! When I lived in Pittsburgh, Pennsylvania in the mid-90s, I used to visit an Asian-themed “bowl” type of restaurant which is still there, I think, but appears to have changed ownership or management. This restaurant was popular with the Carnegie Mellon University and University of Pittsburgh student populations and was right down the street from my office. Many different bowls were popular and usually included at least one kind of meat, several kinds of vegetables, and usually rice or noodles, sometimes floating in a broth. Usually herbs and chopped nuts were used as garnishes on top. It was a nice quick lunch as the lines moved quickly. The “to go” bowls were all the rage with students looking to save time and grab a quick lunch. Taking this “bowl” idea, I made a Tex Mex-based one-dish meal one evening. It’s sort of like a giant salad but arranged more like a Cobb salad with ingredients in rows or mounds on top of greens. I had some leftover rice that had cumin and cheddar cheese in it that I’d warmed up. First, some baby arugula went into the bottom of a large dinner bowl. 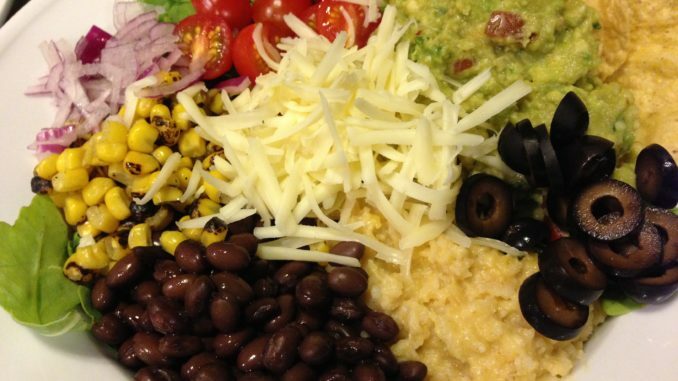 Then, I added mounds of black beans, my warmed cheesy rice, diced tomato, roasted corn, shaved purple onion, homemade guacamole, sliced black olives, and tortilla chips. I piled a handful of shredded Monterey Jack cheese in the center and then drizzled salsa and chipotle cream dressing. And garnished with chopped cilantro. This Tex Mex Bowl is a huge hit with my husband. Most “bowls” have a protein such as meat or beans, a starch such as rice or whole grains, several types of vegetables, some dairy such as cheese, chopped herbs, and perhaps some nuts. Salsas or dressings can top the bowls and be mixed in. I expect to come up with more types of bowls in the future. They’re super easy for satisfying weeknight meals. 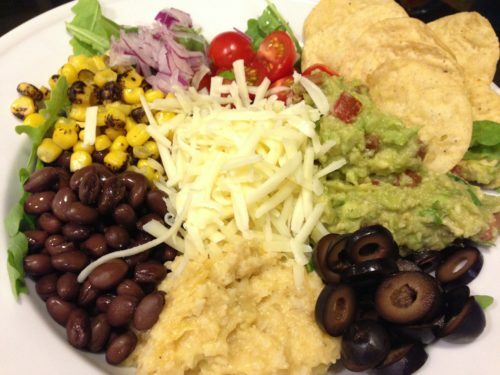 Additionally, this Tex Mex Bowl is a simple option for work or school lunches. You might want to place the greens on top of the other ingredients in your lunch bowl so they don’t get soggy. Be sure to package the chipotle cream dressing and salsa in little containers for addition just prior to eating. Stay tuned for my upcoming breakfast bowl posting(s)! 1. Place the salad greens in the bottom of two large dinner bowls. 2. 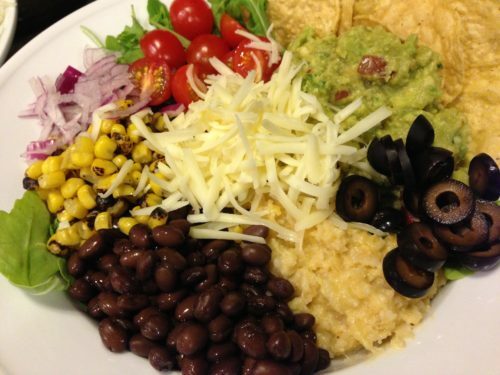 Around the edges of the bowls, add mounds of black beans, rice, fresh tomato, roasted corn, purple onion, guacamole, black olives and tortilla chips. I like to layer the tortilla chips around the guacamole for dipping. 3. Mound the shredded Monterey Jack cheese in the middle. 4. Drizzle salsa and chipotle cream dressing on top of the bowl ingredients. 5. Garnish with chopped cilantro or parsley, and serve. Makes two bowls for main course meals. Start with an appetizer of my Chile Con Queso with Smoked Chipotles and more tortilla chips. Variations: Add some warm or chilled shredded cooked chicken, beef, smoked pork, or taco-seasoned ground meat. 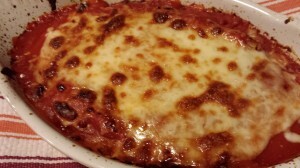 Use cheddar cheese instead of Monterey Jack. Substitute warmed refried beans for the black beans. Use your favorite greens. Add additional vegetables that you like. Season the salad with chili powder and/or cumin powder. Swap out the chipotle cream dressing for dollops of sour cream or Mexican crema. Crumble the tortilla chips over the bowl instead of leaving them whole. To lighten this recipe, omit the cheese, chipotle cream dressing, and guacamole, and add more greens and veggies.